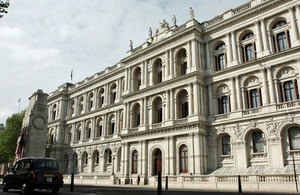 Foreign Secretary William Hague: "We need to see visible, verifiable and indisputable signs of change". “Today’s lessening of violence in Syria is a first fragile step towards peace that needs to be strengthened and sustained. I urge the Assad regime to implement fully its undertakings to the Joint Arab League and UN Special Envoy on Syria, including withdrawing troops and weaponry from residential areas. The Syrian government has a record of failing to keep its promises. It has the opportunity to change that now: it should seize it. We need to see visible, verifiable and indisputable signs of change. The opposition must also ensure that they adhere to the ceasefire and work to strengthen and broaden it. “The international community will support this process. We urgently need to see monitors in Syria to assess implementation. It is crucial that their remit allows them freedom of movement and access. We are working closely on this at the United Nations.